National best-selling and award-winning author Lily King' s new novel is the story of three young, gifted anthropologists in the 1930s caught in a passionate love triangle that threatens their bonds, their careers, and, ultimately, their lives. English anthropologist Andrew Bankson has been alone in the field for several years, studying a tribe on the Sepik River in the Territory of New Guinea with little success. Increasingly frustrated and isolated by his research, Bankson is on the verge of suicide when he encounters the famous and controversial Nell Stone and her wry, mercurial Australian husband Fen. Bankson is enthralled by the magnetic couple whose eager attentions pull him back from the brink of despair. Nell and Fen have their own reasons for befriending Bankson. Emotionally and physically raw from studying the bloodthirsty Mumbanyo tribe, the couple is hungry for a new discovery. But when Bankson leads them to the artistic, female-dominated Tam, he ignites an intellectual and emotional firestorm between the three of them that burns out of anyone' s control. Ultimately, their groundbreaking work will make history, but not without sacrifice. Inspired by events in the life of revolutionary anthropologist Margaret Mead, Euphoria is a captivating story of desire, possession and discovery from one of our finest contemporary novelists. Euphoria is one of those books that I feel a little nervous about reviewing because it is a story built around a very specific topic, and I don’t want to interpret something wrong or say something that is completely off target. So, for the most part, I’ll just keep it as general as possible. Although I did take an Intro to Anthropology class, and a Magic, Ritual, and Religion anthropology class in college, I don’t remember specific terminology. Please excuse any shortcomings or amateur perspectives I might have while reviewing this book. Set in 1930’s New Guinea among indigenous tribes, Euphoria was inspired by the “revolutionary anthropologist”, Margaret Mead. A lot of anthropological lingo is used in this novel, but it isn’t overbearing. Lily King’s intelligent and profound speculation and story spinning is glorious to read. Whether or not the author set out to do this, Euphoria will challenge perceptions of the self and of civilized society. The story is narrated by “Bankson”, who is technically considered the “third wheel”. It’s between him and Nell Stone, the female protagonist, that an affair develops. I absolutely LOVED being in Bankson’s head and instantly felt the kind of appeal he must of had to Nell Stone seep through the pages and infatuate me with him. Though far from innocent, Bankson has this irresistible naivete to him. 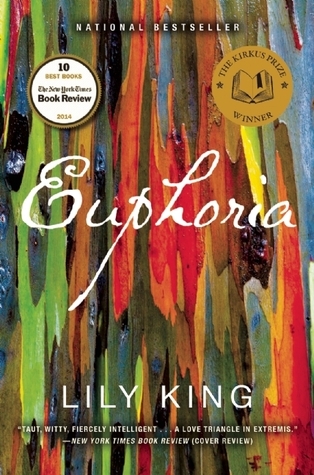 Observations (often shocking) are veiled in scientific objectivity in Lily King’s Euphoria. Lily’s characters have very specific ideas and feelings about the people they are researching and the methods by which they go about it, and under the premise of research, things quickly begin to come undone in their personal lives. Objectivity gives way to attachment, consternation, greed, and mourning on multiple levels. Soul stirring explorations of how people function and how people love are compared to these primitive cultures alongside how they mourn differently from “civilized” society. This book is one that will appeal to the sentimental and practical reader alike. I could not take my eyes off her. It was as if she were performing some trick, some sort of unfolding. There was something raw and exposed about her, as if many things had already happened between us, as if time had leapt ahead and we were already lovers. The characters are reminiscent of the 1980’s film Out of Africa, and the world building was powerful enough to carry the story on its own. The pacing was perfect within its 267 pages, and the author’s syntax and sentence structure was lyrical and creative without excess. It made the scientific and philosophical context of the story very atmospheric of the time period. The ”love triangle” aspect of this story is definitely less built upon then the dust jacket synopsis would have you believe, but it does become engrossing by the last few chapters of the story. The characterization was familiar and perfect, and everything you would expect from male and female anthropologists in the 1930’s. My only complaint is that I wish it would have been around 50 pages longer. The ending seems to unfurl rather quickly, and I felt shell-shocked by this. Overall, reading Euphoria was a refreshing experience. It’s definitely a book that I will read again. This is an amazing and completely captivating video of an isolated tribe that meets a modern ”white” man for the first time. This is not the type of book I would usually pick up. That being said, it sounds REALLY good. Like, I am adding it to my TBR good. I do find this kind of historical and anthropological stuff rather interesting, so I guess it makes sense that the story sounds so good. And I do have to admit, the love situation has me intrigued as well 😉 GREAT review, I am definitely adding this one, thanks so much for introducing me to it! Like you, I decline to summarize books I review for the most part, choosing to share my reactions instead. I purchased this book and then loaned it to a friend to read. I read Father of the Rain and loved it. I would describe her writing style just as you did. Better get this one back so I can read it! 🙂 Thank you!